France reached the Davis Cup final after completing an easy win over defending champions the Czech Republic with victory in the doubles rubber. 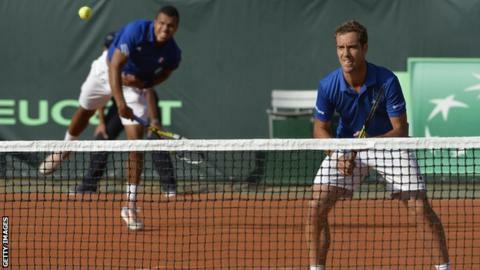 Richard Gasquet and Jo-Wilfried Tsonga beat Tomas Berdych and Radek Stepanek 6-7 6-4 7-6 6-1 at Roland Garros. They must wait to discover their opponents after Italy cut Switzerland's lead to 2-1 in their semi-final. Simone Bolelli and Fabio Fognini beat Stan Wawrinka and Marco Chiudinelli 7-5 3-6 5-7 6-3 6-2 in Geneva. Victory in the doubles completed a straightforward 3-0 win for France in Paris, handing the Czechs their first defeat in the international tournament since 2011. France had won both of Friday's opening singles matches, with Gasquet beating Berdych in straight sets and Tsonga recording a similarly comprehensive victory over Lukas Rosol. "I'm very proud and very happy," said Gasquet. "It's great to win against the Czech Republic. We fought a lot. The other finalist will be decided on Sunday, with Switzerland needing to win just one of the reverse singles matches to reach a first Davis Cup final since 1992. Roger Federer, who was rested for the doubles, is likely to face world number 17 Fognini, who defeated Andy Murray in April's quarter-final against Great Britain in Naples. Italy were on the verge of elimination at two sets to one down in the doubles rubber, but Bolelli and Fognini, who both lost in Friday's opening singles matches, engineered a spirited fightback in front of a partisan Swiss crowd. "We played four very tough hours and we were 2-1 down," said Bolelli. "[We showed] great emotion and great heart today." Defeat means that Wawrinka and Chiudinelli have now lost all four of the Davis Cup doubles matches they have played together.